Spring is a time when those of us who work on a school calendar start to think about 2 things: 1) summer vacation, and 2) September. If you’re in a position that involves managing staffing, at least some of the September thoughts likely swirl around how to recruit talent that aligns with your district’s values. Here at Hello, we’re no different. We are always thinking about how we attract and retain the best and the brightest, the people that will best serve the districts and individual clients we work with and who embody our 4 core values of Put Kids First, Practice WorkLife Balance, Provide Quality Service, and Give. While we think we do a pretty good job of finding the best and the brightest, our Leadership Team has become increasingly focused on the need to increase the diversity within our ranks. Speech pathology programs have historically been filled with mostly females. The American Speech and Hearing Association (ASHA) reported that in 2015 only 3.7% of SLPs were male. That same report stated that 7.8% of ASHA members identified as a racial minority. These numbers are dismal, and work is being done at the national level to encourage a more diverse group to pursue speech pathology as a career. That being said, we at The Hello Foundation are not hitting even these low numbers. We can do better. We need to do better. We serve a diverse population in cities and rural areas in six states: Oregon, Washington, California, Alaska, Montana and Wyoming. Sadly, our staff does not reflect the kids we serve or the communities we come from. We want to actively think about how to become more diverse in all areas: age, gender, cultural background, race, religion, sexual orientation, and personality. We know the more diverse our group, the more perspectives we hear which enables us all to grow personally and professionally. 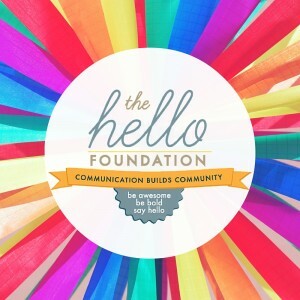 In that spirit, The Hello Foundation’s first ever “diversity committee” met last week. We came together to start the intentional work of expanding our Hello Family with diversity in mind. Our first order of business, as we mentioned in this blog post, is to prepare to take part in the Emerging Leaders summer internship program. We are also reviewing all of our written materials and our hiring procedures to identify places that need more attention and/or revision. Our committee is just getting started, but when the leadership at THF sets their eyes on a goal, we are fierce in seeing it through. We’ll get this done and are excited to share our journey with you.